Guitars and microphones littered the stage as ‘70s and ‘80s music blared from a speaker on Saturday night. The small crowd standing shoulder-to-shoulder in the Red Room @ Cafe 939 chatted excitedly as they waited for Tow’rs, an indie band from Flagstaff, Arizona, to take stage. Soon the pre-concert music faded and all but the stage lights dimmed, and the band’s five members assembled onto the stage in silent, humble fashion. Without words and without an opening act, they began harmonizing and tuning their instruments. The crowd fell silent. Cellist Emma Crislip was the first to break the quiet, pulling her bow over the strings with precision and grace. 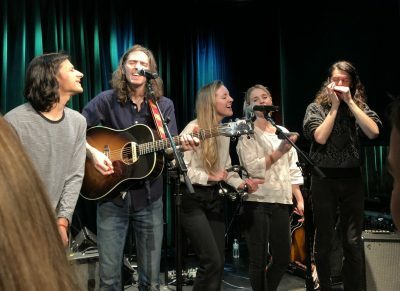 The wailing cello was eventually joined by guitars, drums and the smooth, almost melancholic voices of lead singers of the band — and married couple — Gretta and Kyle Miller. fThe sold-out crowd was transfixed. They stood still and wholly enraptured by the scene unfolding before them. Soon, some began to sway and sing while others sheepishly pulled out their phones to photograph and record. Rather than forming a collective feeling of camaraderie, the crowd was individualistic. The front row stood at a respectful distance from the stage. People silently sang along. Others closed their eyes as though they were feeling the melodies and lyrics rather than just hearing them. At the end of each song, applause sounded like a gentle rain. The whole evening had an almost sacred feel. The musicians’ actions contributed to this atmosphere. They held their instruments with the utmost care and bobbed their heads rhythmically as they played. Each seemed to be in their own world, yet somehow unified. The instrumental bridges were the most expressive. Each member of Tow’rs moved with their instrument in a carefree, elegant kind of way. Swaying as they sang, some members of the band even jumped and spun at times. In between songs, Kyle and Gretta Miller took turns speaking. And despite the deep, universal themes or societal commentary explored and expressed in their songs’ lyrics, they cracked jokes and left the crowd roaring with laughter — the loudest the audience was the whole evening. When they weren’t offering antidotes and snippets of sarcasm, the couple gave glimpses into the inspiration of their songs. One song reminisced on the first time Kyle said, “I love you” to Gretta. Another was formed after reading one of Aesop’s fable about joy and sorrow. Another dabbled into the concept of grace, and another still recounted American silence after the shooting of 12-year-old Tamir Rice. The evening ended with the band hovering around a set of two microphones. They used only their voices, a harmonica, a guitar and a drum for the final song. In these final melodies, a sense of unity finally coalesced as members of the audience emerged from their individual reflections and enjoyment to collectively sing along with the five on stage. The room rumbled with voices during the chorus. The musicians smiled among each other and sang wholeheartedly. When the music ended, they thanked everyone for coming. The group’s multi-instrumentalist, Kyle Keller, scurried to the merchandise table shortly after their last song. He spent the next 45 minutes or so selling T-shirts, albums and posters to starry-eyed audience members. Gretta Miller socialized, posing for photos, shaking hands, giving hugs and pausing for conversations with audience members. Her husband later joined as their two toddlers ran excitedly around the room under a babysitter’s watchful eye. Crislip and percussionist Dan Bagley shuffled on and off the stage, putting away their equipment. The band was intentional in their actions. They greeted each fan they met with a smile, and graciously engaged in conversations with the strangers who were bombarding them. They seemed just as happy to have performed as the audience was to have attended. Slowly the room emptied as lingering concertgoers left with autographs and wide smiles. The Tow’rs left the now empty Red Room at Berklee College with the understanding that their fans would welcome them back to Boston in a heartbeat.